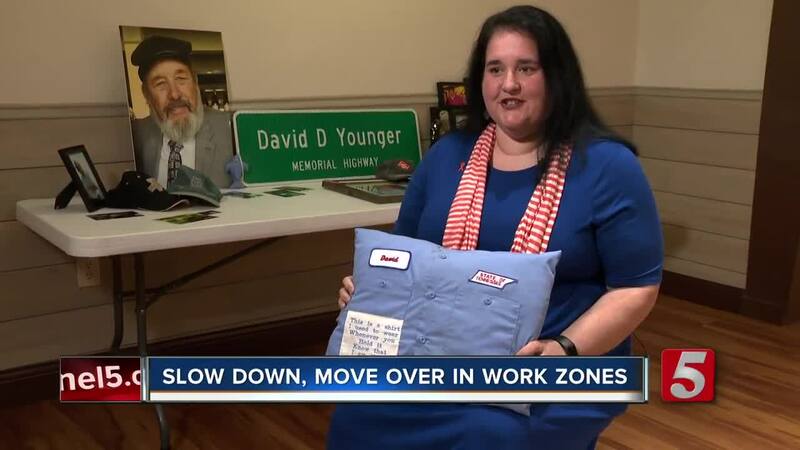 Daughter of TDOT worker reminds drivers to "move over"
NASHVILLE, Tenn. (WTVF) — For Sarah Tolentino all that she has left of her father are pictures and memories. "When things like this happen you come to grips with whats important in life," she said. She remembers her dad David Younger as a hard worker, a man who was the band team dad and the softball coach. Who spent as much time as he could with his kids and grandkids and who worked his way up the ladder to become a TDOT supervisor in a few short years after going back to school to receive his GED. "He was a clown, he loved to goof and have fun," she said. She showed NewsChannel 5 Traffic Anchor Rebecca Schleicher a picture of the white TDOT truck he was so proud to get upon his promotion. But three years ago, along Interstate 40, everything changed. "He was helping a different crew that had a flat, which of course that's my dad he's gonna stop and help anybody," she said, "then just out of the blue someone who wasn't paying attention comes and just plows through the whole crew." It was a horrific crash, captured by images from Sky 5 on April 28, 2016. Troopers say tractor trailer driver Candelario Castillo wasn't under the influence. He just wasn't paying attention. "There was no reason for the wreck to even happen," Tolentino said. Younger was the 110th TDOT worker killed on the job. Since then two more have lost their lives. Their names are engraved on a memorial on I-40 in Smith County. And the stretch of road where Younger was hit and killed has been renamed for him, on I-40 in Hickman Co past Dickson. Sarah is holding out hope that sharing her pain can get people to slow down, move over and pay attention. "If one person can change their style of driving, their means of being safe, then maybe they can influence one more person and they can influence one more," she said. Because there are hundreds of moms and dads who work on Tennessee Highways every day. And they all deserve to make it home. According to the data, driving safely in work zones is more likely to impact your own life. Last year 20 people died in work zone crashes in Tennessee. Three died in Kentucky. Most of them weren't workers, but drivers or passengers.